When I make my Shrimp Po’ Boys (adapted from Tyler Florence) I always take a minute to whip up extra of this little spice mixture, Hot & Smokin’ Po’ Boy Spice. It’s become a bit of a “house” seasoning. This spice is very simple; it almost seems to simple to be true. Almost, except that Hot & Smokin’ Po’ Boy Spice has one of my Stealth Ingredients, smoked paprika. The smoked paprika gives this such a smoky depth. This differs from the Creole and Cajun Blends I so often use. Without the herbs in those more complex blends, this Po’ Boy seasoning rings out clear and true, with just a bit of a bite and a subtle smokiness. Double or triple this (using tablespoons for the measures makes tripling easy) and put it in a jar with a shaker and keep it on hand. Don’t keep for too long, though because there aren’t any preservatives in this blend. 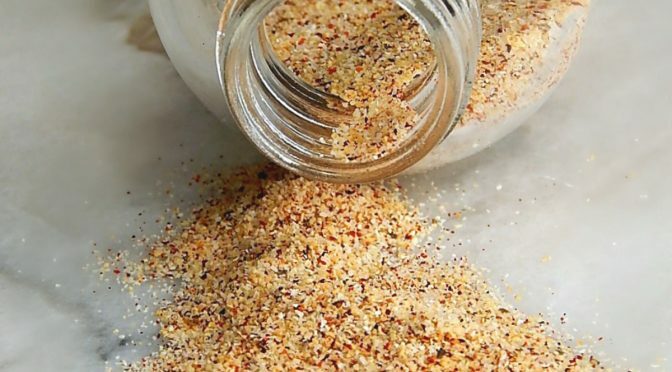 There are times you absolutely need the best quality ingredients in a mix, and here freshly ground black pepper and a good quality cayenne and paprika make a difference. As for the garlic and onion powder, save a little by keeping picking up larger bulk jars if you use often. Try it, of course, in your Po’ Boy breading (this makes enough for the Po’ Boys), but use it in just about anything breaded. You’ll probably want to shake it over grilled items, use it on french fried or baked potato wedges, and FYI, a pinch or two in Hollandaise sauce is magical. Mix together, store in an airtight container. You may wish to double or triple and put in a jar with a shaker to use on all kinds of things. Shrimp Po’ Boys – They may look like any ol’ Po’ Boy but they are outstanding! This entry was posted in Click here for Fabulous Food Posts and tagged Cajun & Creole, Po' boy, Southern Cooking, Spice & Herb Blends, Tyler Florence. Bookmark the permalink. Where do I find your recipe for your Denver green chili? Hi Kelly, that one was in a ook off and is on the Ranting Chef’s site. The look on my son’s face at his first bite of those Po’ Boys! 🙂 They really are good! Too good? This balance of flavors should be in a shaker with your go to seasonings. Sprinkled into soups, over vegetables, rice dishes, meats, seafood or a Bloody Mary, it will add the “Pop” you need. Thank you Frugal Hausfrau for this addition to my spice cabinet. And I don’t drink at all, but this would do nicely sprinkled in next to the dill pickle spear and celery. I was just expressing a similar canvas if you will, about food creations, when discussing White Bean Dip with Rosemary, with blogger Pamplemousse. I totally understand. It is easy for me to be swayed, bribed if you will; by a thought, recipe, or even a picture of some foods. And then the reality of how much do I want to workout to work this off, sets in.